After a person makes a gift to your Crowdfunding campaign, it is important that you send them a personalized thank you email. On your Funderbolt dashboard, you will have the opportunity to thank Supporters who gave through your Advocate Page, and then you can also claim any other Supporters who remain unthanked. Click Thank Your Supporters to thank the people who have given through your Advocate Page or click Thank Unclaimed Supporters to thank someone who has given to the general campaign page or another person’s Advocate Page. 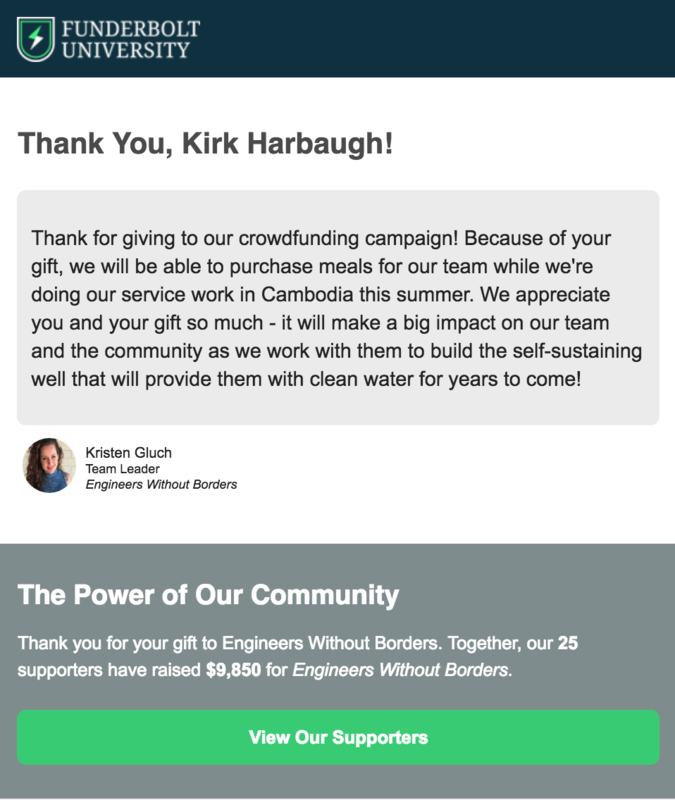 What will the full email look like to the Donor? Is it just my message? Your message will be sent within an email that is already designed and branded to your school. You do not need to write a greeting or salutation, because that will already be a part of the design. Note: The greeting will include the Supporter’s real name, regardless of what name or phrase they chose for the Supporter Wall. Simply write a few sentences thanking the Supporter, and it will appear within the gray box shown above. The rest of the email will populate in the Supporter's email. How should I prioritize thanking Supporters? Thank your own Supporters first by thanking everyone listed in the Thank My Donors tab. After you thank them, you can move onto the Thank Unclaimed Supporter tab. Are my Team Members’ Supporters (i.e., people who gave to a Team Member’s Advocate Page) listed in the Claim Unthanked Supporter tab? Yes. To ensure every Supporter gets a thank you message, Supporters who have yet to be thanked will be listed in the Claim Unthanked Supporter tab, including those who gave through Advocate Pages that aren’t yours. You can check in with your team before claiming unthanked Supporters to make sure your Team Members get the opportunity to thank their own Supporters first.